Kazan chemical plant imeni Vakhitova awarded the order of red banner of labour for achievements in the 9th five year plan. Batyev order attaches to the flag and congratulates award Vahitova. The building of the chemical plant imeni Vakhitova. Pipelining is soap, box of detergent, bottle of glycerin. Order on the banner of Vahitova. The collective farm "Rassvet" of the Mari ASSR. Special attention is paid on the farm agricultural machinery. Seeds are inspected by the state seed Inspectorate. 3. The Chuvash ASSR. The "competition". Cheboksary cotton mill of the order of the red banner of Labor. Dozens of weavers involved in the socialist competition (Yuliya Petrov, Hero of Socialist labor spinner first factory Taisiya Ivanovna Afanasyeva). 4. TASSR. "Invitation to Vasilevo. Vasilevo is a well – known health resort of Tartary. Here, for the workers of KAMAZ built a new Spa building. The Chairman of the management of the resorts of Tatarstan albert galievich Khamidullin on the development and improvement of the resorts of the Republic. 5. Mari ASSR. "Mari coffee. In the arboretum of the Mari Polytechnic Institute, about 400 species of tropical plants and trees. Their study involved members of the student scientific society under the leadership of Professor Mikhail Kotov. The result – a 15-year-old coffee tree gave its first fruits. 6. The Chuvash ASSR. "To be the inspector. 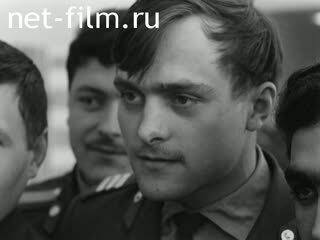 Lieutenant Nicholas Romanov, senior police inspector. A policeman takes fingerprints on the film. The city goes a police car.